Fianna Fáil leader Micheál Martin speaking to the media following his meeting with Leo Varadkar today. 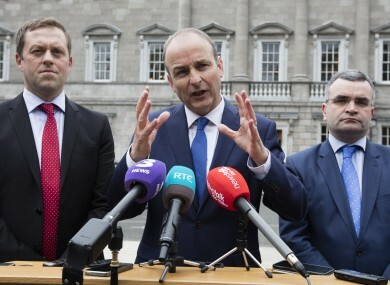 FIANNA FÁIL LEADER Micheál Martin has said he has no reason not to trust Leo Varadkar, adding that his party will abstain in the Dáil vote to make him Taoiseach next week. Following a meeting with the new Fine Gael leader in Government Buildings today, Martin said he had a “constructive” and “frank” discussion with Varadkar about keeping up the confidence and supply agreement (the deal propping up this government). There have been hostile exchanges between the Social Protection Minister and Martin in the past, with Varadkar stating that he doesn’t trust Fianna Fáil. “Leo has said a lot of things in the past, such as ‘not another red cent‘… I didn’t get any of that hostility in the meeting to be frank,” Martin told reporters today. Varadkar’s now infamous “not another cent” comments were made during the general election in 2011, when he stated that the banks would get no more money from government. A year later Taoiseach Enda Kenny stated that Ireland would not impose losses on bondholders. “As far as I am concerned I have worked with Enda Kenny the last 12 months in terms of the implementation of the confidence and supply agreement, and on a personal level, I don’t see any issues emerging. “On a personal level, I have no reason not to trust Leo Varadkar and I go into these meetings in good faith. We don’t know each other that personally, but we are two pragmatic, professional politicians. We want to see things done for the country,” said the Fianna Fáil leader. “We read things in the media and I think Leo has said things he clearly regrets… but I don’t anticipate any of those issues arising,” he added. Move to right for Fine Gael? With Varadkar using lines that he wants to represent “people who get up early in the morning”, there has been a lot of talk since his election as leader that he may take the party down a more right-wing route. We will have to wait and see the difference between rhetoric and what actually happens in terms of his policy implementation. As far as we are concerned we have tempered the worst excessives of Fine Gael, but they are always there to be pushed out. He has indicated he is prepared to honour the confidence and supply agreement – that is the key. He said Fianna Fáil continues to be a party that promotes “fairness and decency”. At aged 38, Varadkar is the youngest Fine Gael leader in history. Martin was asked if he feels old facing down the new leader at age 56. “I don’t feel old at all,” he replied, firmly adding that he will be leading Fianna Fáil into the next election. Varadkar has had a busy day today, meeting not only Martin, but other independent TDs and ministers who he hopes will support him in the vote to be Taoiseach next week. Communications Minister Denis Naughten, Children’s Minister Katherine Zappone and Rural Independent TD Dr Michael Harty met with the new Fine Gael leader for over an hour this afternoon to set out their stall. Speaking following the meeting, a spokesperson for Zappone said the minister and her colleagues had “over two hours of professional discussions on national issues” with Varadkar. Zappone raised a number of key issues related to her Department, the spokesperson said. Among these were a need to build on a radical new approach to childcare. Zappone also outlined new approaches she felt could be taken to secure the release of Irish citizen Ibrahim Halawa who in imprisoned in Egypt. Zappone’s spokesperson said she “welcomes Minister Varadkar’s willingness to consider these”. She also proposed a process in relation to repealing the Eighth Amendment which would see the wording of a referendum and legislative options developed in tandem with the work of the Oireachtas Committee. Halawa has spent almost four years in jail and the Irish government has said it has stepped up its diplomatic efforts in recent times to secure his release. His next trial date is set for Tuesday, 4 July. Despite the good work by department officials and the Minister for Foreign Affairs Charlie Flanagan, Zappone said the Irish government has not reached its goal, and she wants efforts stepped up. Dr Michael Harty, who has previously put the government on notice that he might withdraw support for government, said next week’s vote is a very different situation compared to when he voted for Enda Kenny to be Taoiseach last May. “My vote was to create a government… this is a different occasion where we are changing the leader of Fine Gael,” he said. Harty said he has a lot of issues with the implementation of the programme for government, particularly when it comes to rural affairs. “I would be expecting a lot from Leo Varadkar on that,” he added, highlighting that he wants to see action on balancing regional development as well as the unraveling of the post office network around Ireland. All of the meetings were useful and I feel that we are going in the right direction. Yesterday, Varadkar met with members of the Independent Alliance, with another meeting scheduled with the group this weekend. While a vote to elect the next Taoiseach was expected to take place in the Dáil next Tuesday, it is now mooted to take place on Wednesday to ensure Enda Kenny has a satisfactory send-off from his colleagues. Email “Micheál Martin says he has no reason not to trust Leo Varadkar ”. Feedback on “Micheál Martin says he has no reason not to trust Leo Varadkar ”.